← Trichy Sankaran and his Kanjira meet a North American drumming tradition. 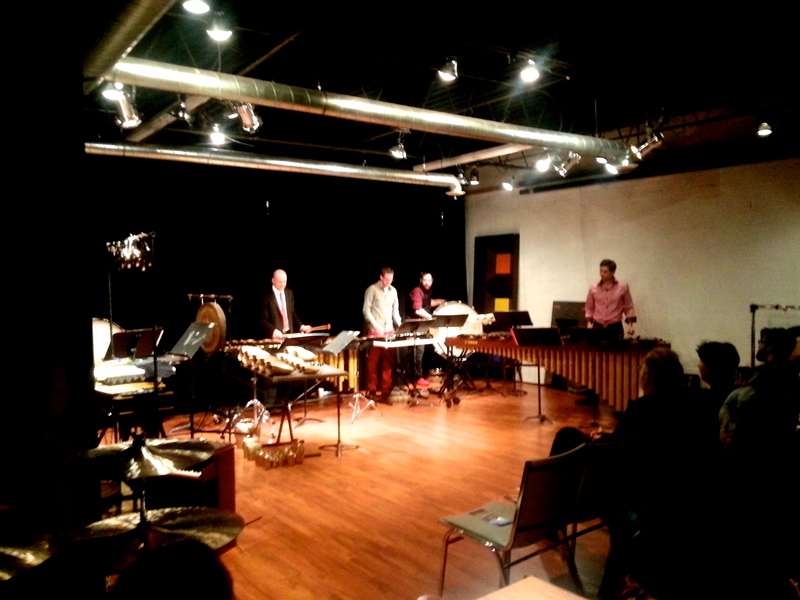 TorQ Percussion Quartet in the Array Music Concert Hall, 20 November, 2013. L. to R. Adam Campbell, Jamie Drake, Daniel Morphy, Richard Burrows. Cell phone photo courtesy Frank Morphy. TorQ struck again, pun intended, this time with a concert of music for Prepared Piano by John Cage, all arranged for traditional percussion instruments by members of TorQ. I last heard TorQ in the Toronto Dance Theatre, playing works which were choreographed for existing music, as I reported on this site in TorQ Ensemble: Morphy, Rolfe, Reich and Cage, 28 June, 2013. That concert was an unforgettable experience. Consequently, I was prepared for this one to be at best, less memorable. This TorQ program began with Bacchanale (1938-40), a vivacious complexity of rhythms and tempi written for dance and the first work by Cage for Prepared Piano. Of the 20 movements in Cage’s Sonatas and Interlues, (1946-48),TorQ members arranged and played 11: 8 Sonatas and 3 Interludes. The first half ended with an exquisite arrangement by Jamie Drake of the mezmorizing In A Landscape (1948), the only unprepared piano work on the program and ended with an arrangement of a John Cage oil painting titled Chess Pieces (1944). The program was appropriately titled Sonatas and Interludes. Western percussion ensembles and the Prepared Piano are commonly thought to have been invented by John Cage: the percussion ensemble to provide him with solutions to compositional issues and later, the Prepared Piano to provide him with a percussion orchestra free from extra players, their accoutrements and expenses. However, there were important antecedents to both the western percussion ensemble and the Prepared Piano and Cage himself affirmed this during a phone conversation. When I asked him if he had invented them Cage said, “No, they were in the air”. His exploitation of both genres popularized them and they became indelibly associated with his name. The Prepared Piano proved to be an instrument that offered fresh insights into the aesthetics of sound and influenced generations of performers and composers. The piano is a percussion instrument. When its strings are affixed with nuts, bolts, erasers and other knicknacks, its sounds are altered dramatically, and it sounds even more percussive. Thus, Cage’s Prepared Piano music was written on a percussion instrument altered to sound like other percussion instruments. Somehow, TorQ‘s arrangements for quartet and multi percussion had closed an historic circle in music history. Or have they opened a new one? I was seated with my wife and the very fine percussionist Alison Bent who has recently become part of TorQ‘s management team. Some of the Toronto notables in attendance were John Miller the music impresario of the Stratford Summer Music Festival [1.] and Ray Dillard, percussionist, recording engineer and President of the Toronto Musician’s Association. Also in the audience was Toronto pianist Henry Kucharzyk, whose fine recording of the Sonatas and Interludes (1990) provided inspiration forTorQ arrangers. Toronto percussionist and composer Rick Sacks made his first appearance of the night playing his Kat, an electronic instrument programed for Prepared Piano. Cage never embraced electronic sounds. He did not like recorded music and donated all gifts of recordings to libraries. The Kat’s ersatz Prepared Piano sounds were at variance with the otherwise all acoustic sounds made by TorQ. The Kat simply rang false and yet, its sounds were appealing on their own. Rick is the artistic director of Array Music and is the force behind its new music hall and administrative offices. He is an indefatigable worker. The new hall is splendid. Seating at most 50 people, it is an acoustical gem. The sound is not distorted by excessive dryness or resonance. Small dance and music ensembles not yet aware of its comforts need to check it out. Cage was studying chess under the tutelage of Marcel Duchamp and made a painting titled Chess Pieces for an exhibit by Duchamp and other New York based visual artists. Cage painted a chess board and filled each square with snippets of music. These snippets define the form and structure of the work. American pianist Margaret Leng Tan arranged these squares of music into a piano solo. Thus, Bryan Nozny’s arrangement of Chess Pieces, is an arrangement of an arrangement of an oil painting and sounding within the purview of Cage’s aesthetic. The Sonatas and Interludes concert was a garden of delights, always unexpected, always satisfying. I have grown accustomed to TorQ‘s artistry. They move in unison while remaining flexible. What excites me most about TorQ, is their desire to search out new ideas and realize them, time after time, in musically satisfying ways. [1.] It was announced that John Miller has named TorQ the Stratford Summer Music Festival Artists in Residence for the summer of 2014.